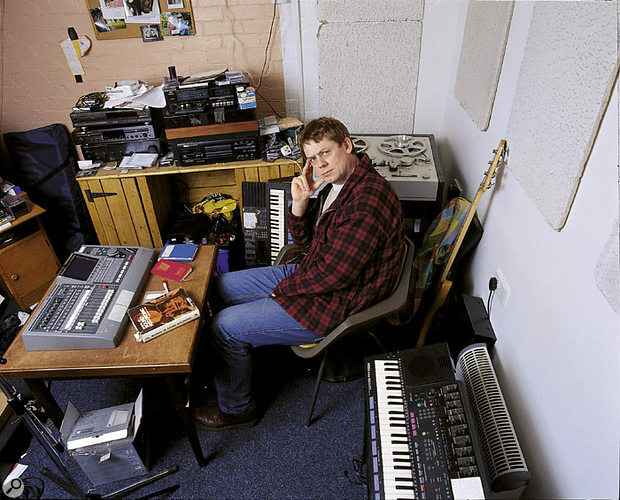 Comic actor Graham Fellows, better known as John Shuttleworth, has been recording and editing his own radio series for years — and now he's putting his engineering skills centre stage. 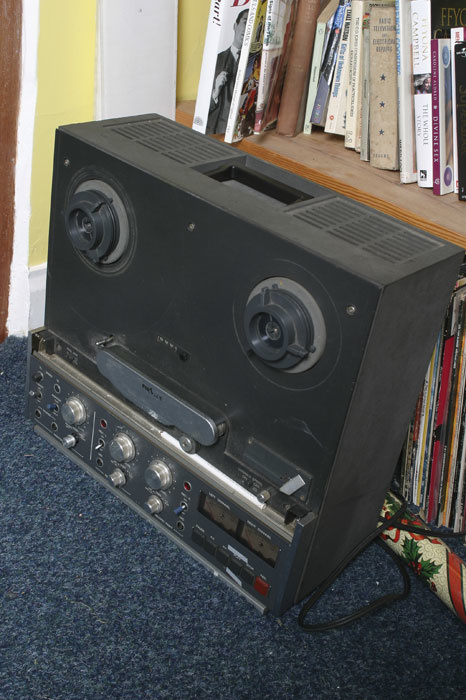 The days when an engineer's life involved hours spent cutting up and reassembling quarter-inch tapes are, for better or worse, behind us. Some will look back with fond memories, others will be glad to see the back of a fiddly and repetitive task, but there's probably only one person who could turn tape splicing into a comedy routine. Whether or not the name Graham Fellows is familiar, the chances are you've encountered some of his alter egos. As Jilted John, he had a top five hit in 1978 with an eponymous Martin Hannett-produced single, while his middle-aged wannabe pop star John Shuttleworth has enjoyed a more enduring career. A sell-out show at 1992's Edinburgh Fringe spawned numerous radio and TV series, national tours, videos and CDs, and John has been joined through the years by a growing cast of Fellows-voiced ancillary characters such as manager Ken and wife Mary. But if the humour in The Shuttleworths arises from the gulf between John's music-business ambitions and his mundane reality, Fellows's more recent creation will strike SOS readers even closer to home. Photo: Richard EcclestoneBrian's live CD from the Let's Look At Sound tour, featuring 'How to edit audio tape' — see www.brianappleton.co.uk for more details. 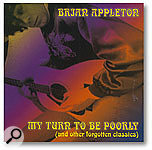 The character of Brian Appleton is closely based on the numerous sound engineers that Fellows has encountered over the years. "He started off as a rock historian and multimedia lecturer, who's been dumped upon from a very great height, as he likes to say, by certain people in the rock industry," explains Fellows. "The first show, Brian Appleton's History Of Rock & Roll, which was also a series on Radio Four, was really just a series of shaggy dog stories where Brian crowbars himself into the true history of rock. I read a lot of rock history — like Howard Jones used to work in a cling-film factory, and Rod Stewart was a gravedigger — things like that I found quite amusing. But that, by its very nature was a limited idea, and there was only really one show's worth there. So for the second show I did, Let's Look At Sound, I decided to make him explore sound, doing an extension of his college lecture on recording technique." "To do it in front of a live audience, and very quickly as well, I practised until I knew exactly where to cut and didn't have to try too hard. But for an audience to see me actually record someone's voice, cut up the tape, stick it together again and then hear the result — and they knew I'd done it because they recognised the voice — was a bit magical. 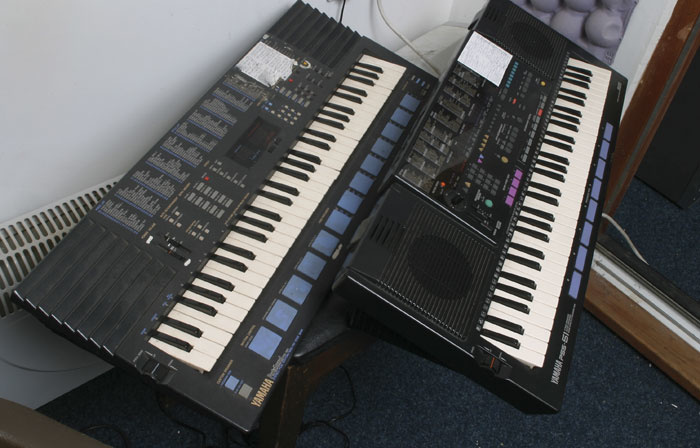 When it worked..."
The Yamaha Portasound PSS680 and PSS51 keyboards, so fundamental to the John Shuttleworth sound. Photo: Richard EcclestoneThe magic of sound is complemented by an obvious delight in technical jargon, as Brian warns his uncomprehending audience about the perils of 'bass tip-up' and dispenses hints on editing technique ("You'll notice I've got a built-in splicer to cut the tape. You can use a razor blade — I prefer not to, because I suffer from depression."). "It was a way of discovering a little bit more about the theory of sound myself. I started to swot up on the way frequencies behave, and I was able then to start writing gags about it. The opening gag in the show was about how sound travels a lot slower than light, and you might therefore think that sound is inferior to light, but actually it's superior, because the fact that sound travels slowly allows us to pinpoint the position of things. If sound travelled at the speed of light, we might as well have one ear. 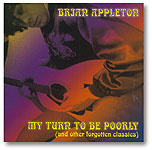 "One of the high points was a recording of a nose-blow, which Brian didn't even know he was recording — he was just clearing his sinuses in preparation for a heavy rock vocal — and then accidentally he hits the half-speed button, and he plays it back and hears his sneeze slowing down and decides it sounds rather attractive. So he starts slowing it down and bouncing it backwards and forwards between two Revoxes. Which I did for real at home." 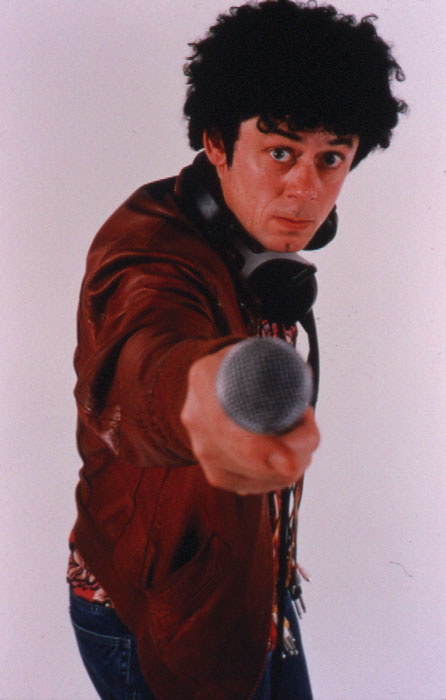 "Perhaps Yamaha's finest moment was the Portasound PSS680," insists Graham Fellows. "It's got so many permutations, and 100 styles. They really pushed the boat out. Unfortunately it's let down by a high-pitched electronic whine. I tend to use the PSS51 more live. I've got two of each." Fellows's best-known character, John Shuttleworth, has remained loyal to the Yamaha brand over the years, favouring the instruments towards the budget end of their home-keyboard range. "I have listened to all of them, and I still check the new models out regularly. The new models fail abysmally because they all sound like records, they just don't have that organ sound. If I think too hard about the equipment I've got on stage I would worry, because a lot of it is a bit Mickey Mouse. I take a perverse delight from going on stage with lots of adults in the audience and playing on a little kids' keyboard." Shuttleworth classics such as 'Pigeons In Flight' and 'Shopkeepers In The North' are all powered by PSS-series auto-accompaniment patterns, with liberal use of the novelty features. "I'm of a certain standard on the keyboard, I know how to get a good sound out of it with three fingers on my left hand and creative use of the Fill button. But because they're mini-keys and I've got quite big fingers, you cannot help but hit the wrong note, so I rely on natural accidents. 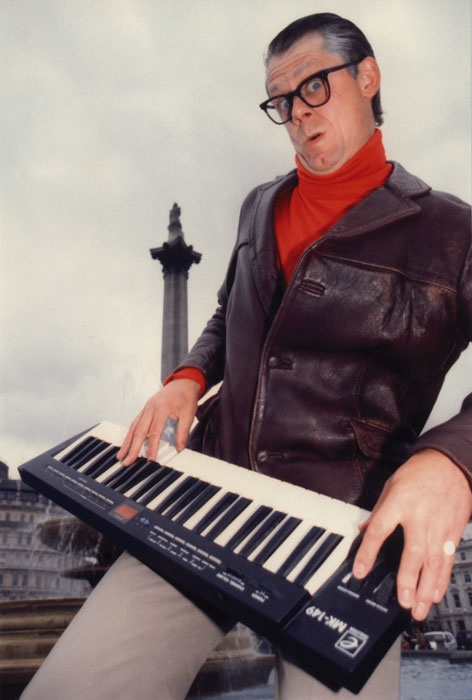 For early John Shuttleworth gigs I used to have a big shell of a keyboard, a big wooden thing, and I used to have the backing tracks of John's songs on a cassette player. I'd give the impression that I was playing the track, but it was all on tape. And that's partly because I couldn't play very well, and the big wooden things didn't have any auto-accompaniment, it was just for visual effect. But occasionally I pre-recorded a mistake." He may be mocking the engineering geek inside all of us, but Brian Appleton is also an extension of his creator's own love of recording and sonic experimentation. "When I was a kid I used to have a little Telefunken recorder, and I used to do an impression of a baby by going 'wah wah' and speeding it up. What interests me about sound is the romance of it. I just love that control you have, where you're stopping time and you're starting to play around with it." John Aldred's vintage Manual Of Sound Recording provided plenty of inspiration for the character of Brian Appleton. 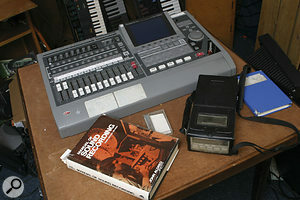 The Aiwa portable DAT recorder, right, sees a lot of use for gathering sound effects and ambiences. Photo: Richard EcclestoneNot only does Fellows do all the voices for radio series like The Shuttleworths, but he has also recorded all of them himself. "If I get a good line that I really like then I'll write that down, but I try not to use a script. This is why I started doing The Shuttleworths, years ago — I used to listen to radio plays and think how false they sounded. You could see the people standing around the microphone with the scripts. And then I heard a Mike Leigh radio play, and it just blew me away. I thought 'This is incredible,' because you were just drawn in. You could see everything so much more clearly. There were no scripts, they'd devised it in the same way he does his stage and TV plays and films, and they were actually moving around in a real environment. They recorded it where it happened. There was a scene in a Chinese restaurant and they stuck the mics on the table — none of these spot-effects people rustling knives and forks. And at times you couldn't quite hear what was going on, and that actually drew you in even more. Which went against the received wisdom of radio recording, as I understand it, where everything should be crystal clear. I think that's patronising to an audience. Sometimes it's quite nice not to quite know what's happening. "That's partly why I wanted to find a new way of recording, and I must have just stumbled on this multitrack thing with my Portastudio. I try to build it up like real conversation, which is totally organic. Basically you've got two people, one of them's talking and the other one's listening, and then at some point will either take over or interject, and then the other person has to listen. And when you're talking, you don't know what you're going to say. So as far as possible, I try to replicate that. I go to track one and I'll be John, and I'll say 'Ah, morning Ken. How are you today? Oof! You've got a bit of egg on your jumper.' Then I'll go on to Ken's track and I'll listen back to that, and when he says 'You've got a bit of egg on your jumper,' Ken might say 'No it isn't,' and that might collide with John's next bit. And if it collides in an attractive way I'll keep it and move on. If I think 'On no, it didn't sound right,' or you can't hear what either of them is saying, I might slip John's line forwards or backwards, or redo the whole thing. The way I get the women's voices is that I slow the voice down a bit, and just get a little bit of sibilance. I slow it down about 10 or 15 percent, and then when you play it back, hopefully it sounds like a woman." 'How to edit audio tape' brings Graham Fellows's Revox reel-to-reel recorder into the limelight.Photo: Richard EcclestoneThese days, series like The Shuttleworths are created on a Roland VS1680 digital multitracker, but it wasn't always so hi-tech. "The first series of The Shuttleworths, which some say is still the best one, was recorded on a Portastudio. I did the pilot on a Portastudio, and then I got the series, and they said 'That was fine for the pilot, but you must have better quality.' So I bought an ADAT, but I was struggling to get the spontaneity. The Varispeed took about a minute to increment, and I needed instant Varispeed — which I've got now, with my Roland VS1680, you just press a button and it's there, you've preset it. To have to wait 30 seconds to slow it down when I want to do Mary's voice is no good, because you've just killed the creative moment. "So I played a trick on the BBC. 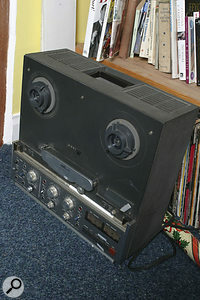 I mastered up a bit of four-track recording made on my Portastudio on cassette, and also mastered it up on a quarter-inch Revox at 15ips. Then I put both of them on quarter-inch. They had both basically come from the four-track cassette, but I pretended that one of them was done on the ADAT and one on the Portastudio. A top engineer at the BBC auditioned my tapes. So I played the Portastudio one first, and he said 'Oh yes, it's a bit hissy.' I said 'It was the best I could do,' and played him the other one. I said 'This was done on the ADAT,' and he said 'Oh yes, that's much better, can you hear the difference? That's fine!' So I went back and used the four-track. "But then I got a bit greedy and wanted more tracks, because I had to do a bit of bouncing, and because of the inability to cut and paste with a linear analogue system — it's like mobile phones, how did we live without them? I couldn't possibly be creative without cut and paste, which I've got now. For me, there was a steep learning curve on this, and it still does far more than I need it to, so I'm sticking with it." "The interesting thing about doing sound effects for radio — I've spoken to quite a few people about this, and they all seem to agree — is that these blinking sample CDs with effects on are more or less rubbish," says Graham Fellows. "You have to really grab something there and then. All these CDs that have been specially made with sound effects very rarely work, I find. They're just awful. For instance, door slams, or atmosphere, or chatter in a pub, or the sound of wind — I think the BBC wind and weather CD has got 10 different types of wind on, and half of them sound like they're done on a synthesizer. "So part of the fun of making radio, I find, is to grab effects there and then and whack 'em in. That's when I use my stereo mic. I'll just go out with a portable DAT recorder, which was the first good bit of kit I bought. It's an Aiwa HHB1 Pro. The design of the rechargable batteries is awful — they get stuck in there, and I tend to use just the normal AA ones. "The other enjoyable thing about making sound effects, and the beauty of radio, is that you can fool the listener into believing something's not what it is. I had to get the sound of a cassette player being switched on, but the cassette player itself didn't sound like anything, so I got a toasted sandwich maker and generated the noise that way. That's where radio scores over TV. It's more creative, really." John Shuttleworth strikes a pose.Photo: Richard Ecclestone Brian Appleton, part-time lecturer in Media Studies (suspended).Photo: Richard EcclestoneGraham now has his own studio room, in a converted vet's surgery — "Acoustically, it's pretty dead, because the brick wall's got bad pointing on it," he laughs — but he's put together previous radio series in a variety of unlikely locations. "I used to record The Shuttleworths in a shed when I lived in London, and the last series was done in a cupboard in a hotel off the A1. The reason for that is that I was acting in a kids' TV series in Elstree, and I had a deadline for the radio show, so I had to do the radio recording in the evenings when I wasn't filming. I was originally going to have a room in the studios, but this room they put me in had a massive double wardrobe, and I realised that if I put a duvet on the door, and sheets and duvets and blankets up the side, it created quite a nice dead atmosphere, and I just recorded away. I did about four of the six episodes like that. "I tend to just stick a mic in the back of the VS and away I go. My bit of luxury is an AKG C414, which I got partly because I was doing a BBC series called Radio Shuttleworth. It involved recording in the studio, interviewing studio guests, but then I had to pretend they were in my house, which involved adding new lines here — so I got one of these because it's what the BBC had. For ages I used to use an SM58, or the one that was sold to me on the strength of it being Elkie Brooks's preferred live mic, the AKG C535. I've got a few SM58s, and I've got an SM57 for if I'm doing drums or anything. I've got quite a nice stereo mic that I use for recording sound effects." As well as perfecting his tape splicing, Graham Fellows has also been experimenting with video editing, and is now putting the finishing touches to a forthcoming John Shuttleworth film, a collaboration with photographer Martin Parr. Meanwhile, Brian Appleton is heading out on the road again in May, in a new show entitled The Very Best Of The Doors — In My Home. Cunningly disguised as a tribute to Jim Morrison and his cohorts, the title actually refers to a new series of sonic experiments, based on recordings of the interior doors of Brian's house. It's certainly a unique basis for a comedy show — so what can we expect? "I haven't really started writing it yet," admits Fellows. "I just like the title."